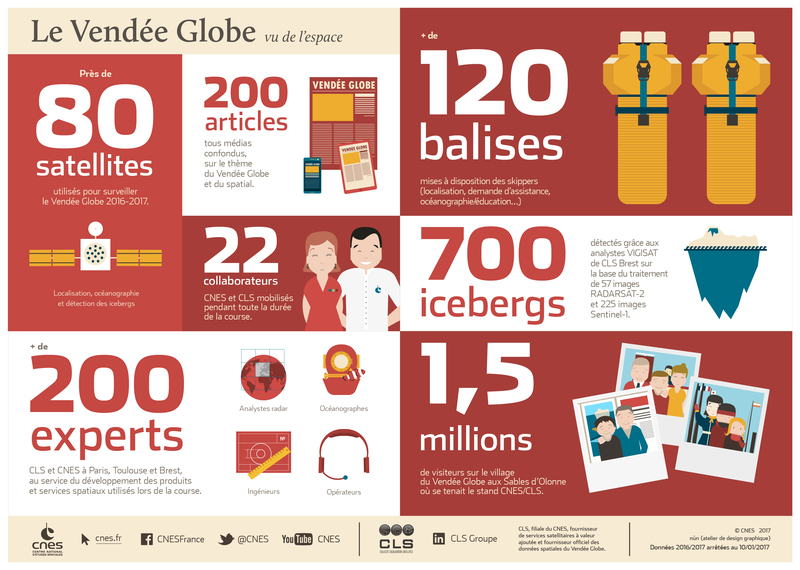 The Vendée Globe is the only solo, non-stop, without assistance sailboat race around the world. Nicknamed “Everest of seas”, only 71 sailors under 138 managed to reach the fish line since its creation. This figure is showing how difficult this worldwide event is, in which sailors are facing extreme cold, huge waves and threatening sky across the great south. Extremes conditions involve exceptional means. The race department asks CLS, Collecte Localisation Satellite, a CNES subsidiary, to watch this modern times adventurer from space. 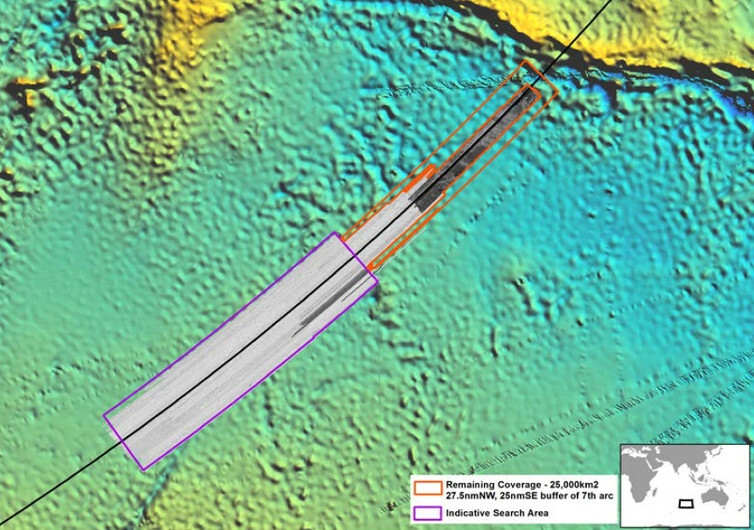 Readjust the direction model using observation data from radar satellites in the Subantartic zone (around 50° South). 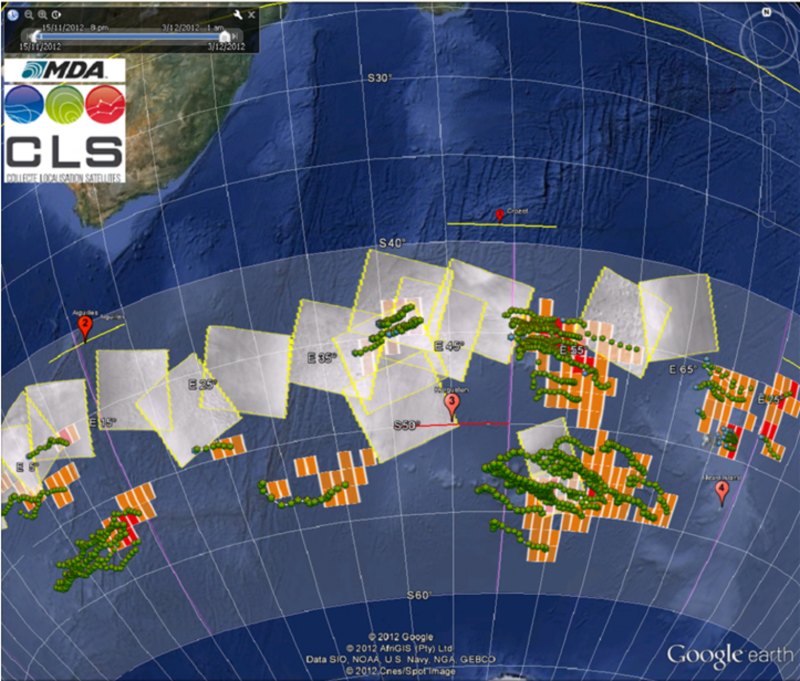 Perform (using these radar images) a correct display of icebergs of a significant size (>50m). 74 days 3 hours 35 min 46 sec... this is what it took Armel to win this Vendée Globe. In reality, it took Armel 10 years to win this race after finishing twice at the second place in the last editions. After two and a half months at sea, Armel Le Cleac'h has finally achieved his dream in one of the world's toughest yacht races -- and in record-breaking fashion. Twice a runner-up in the grueling Vendee Globe event, the French skipper celebrated his first victory Thursday as he crossed the finish line off the coast of western France. He completed the solo round-the-world race in a new fastest time of 74 days, three hours, 35 minutes and 46 seconds. It was almost four days quicker than the previous record set by compatriot Francois Gabart in the 2012-13 edition. That time Le Cleac'h was just two hours back in second place -- the smallest losing margin since the race, held every four years, started in 1988. He was also runner-up in 2008-09. "This is a dream come true," said the 39-year-old, who covered 24,499.52 nautical miles at an average speed of 13.77 knots during the race. "Today is a perfect day. My team have been amazing they're the dream team, and this is their day too." Race organizers predicted that second-placed British sailor Alex Thomson would cross the line 12 hours after Cleac'h, who finished at 1537 GMT (1037 ET). "I'm very happy for Alex, it's a great second place," Le Cleac'h added. "It has been very difficult with him behind me, he gave me a really hard time in this Vendee Globe." Le Cleac'h, sailing his 60-foot vessel Banque Populaire, was met by an estimated 350,000 fans in freezing conditions at Les Sables d'Olonne. France has now won all eight editions of the race. Thomson, who finished third in 2013, looked to be threatening a late comeback after sailing 536.8 nautical miles in 24 hours -- reclaiming the record he held between 2003-2012 for distance covered in that time span. He led the race in the opening weeks, and set two records in reaching South Africa's Cape of Good Hope, but a damaged starboard foil dented Thomson's chances of breaking the French monopoly of the title. Often referred to as "the Everest of the Seas," only half the entrants usually complete the course. Of the 138 sailors to start the previous seven races, just 71 finished -- while three competitors died. This time, 11 of the 29 sailors who began the voyage in Les Sables d'Olonne on November 6 have pulled out. The man in last place, Sebastien Destremau, was almost 10,000 nautical miles behind Le Cleac'h and had yet to pass the notorious Cape Horn off the coast of Chile. This year's race also features 66-year-old US skipper and lifelong acute asthma sufferer Rich Wilson, who is almost three times the age of youngest competitor Alan Roura. He was in 14th place when Le Cleac'h finished. 2016 was the hottest year on record, continuing a decades-long warming trend. Scientists at NASA’s Goddard Institute for Space Studies (GISS) analyzed measurements from 6,300 locations and found that Earth’s average surface temperature has risen about 2.0 degrees Fahrenheit (1.1 degrees Celsius) since the late-19th century, largely a result of human emissions into the atmosphere. Globally-averaged temperatures in 2016 were 1.78 degrees Fahrenheit (0.99 degrees Celsius) warmer than the mid-20th century mean. This makes 2016 the third year in a row to set a new record for global average surface temperatures. 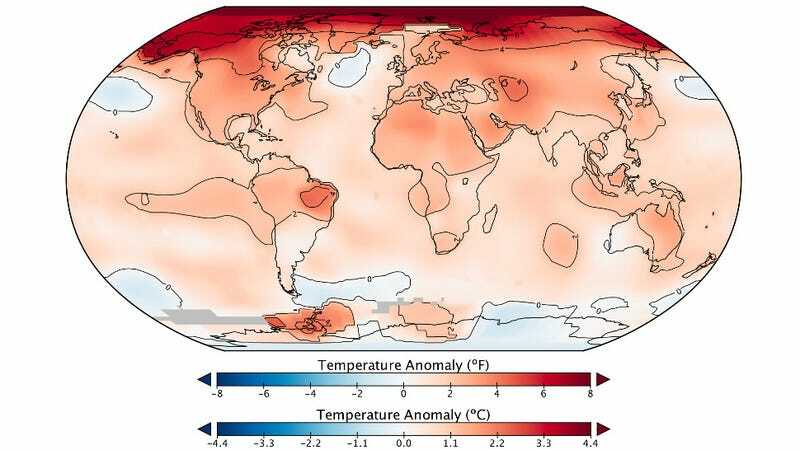 Scientists declare that 2016 was the hottest than year on record since records began. 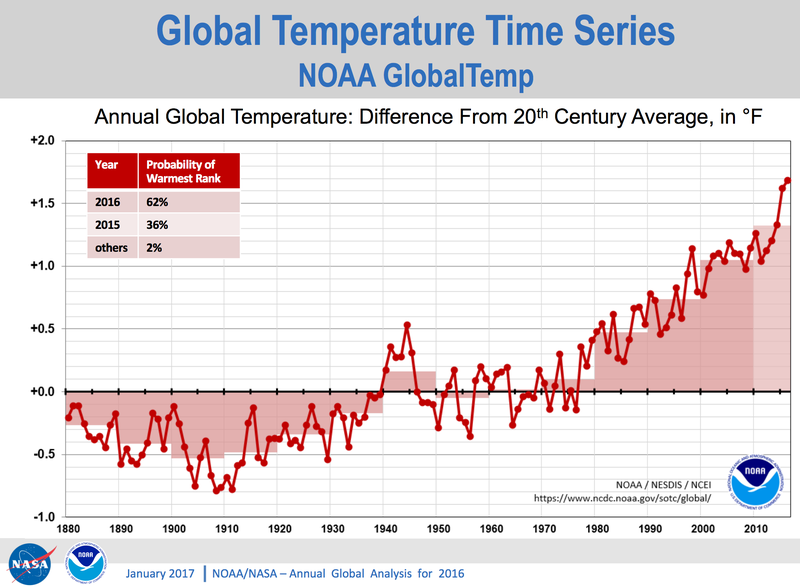 The 2016 temperatures continue a long-term warming trend, according to analyses by scientists at NASA’s Goddard Institute for Space Studies (GISS) in New York. The planet’s long-term warming trend is seen in this chart of every year’s annual temperature cycle from 1880 to the present, compared to the average temperature from 1880 to 2015. Record warm years are listed in the column on the right. 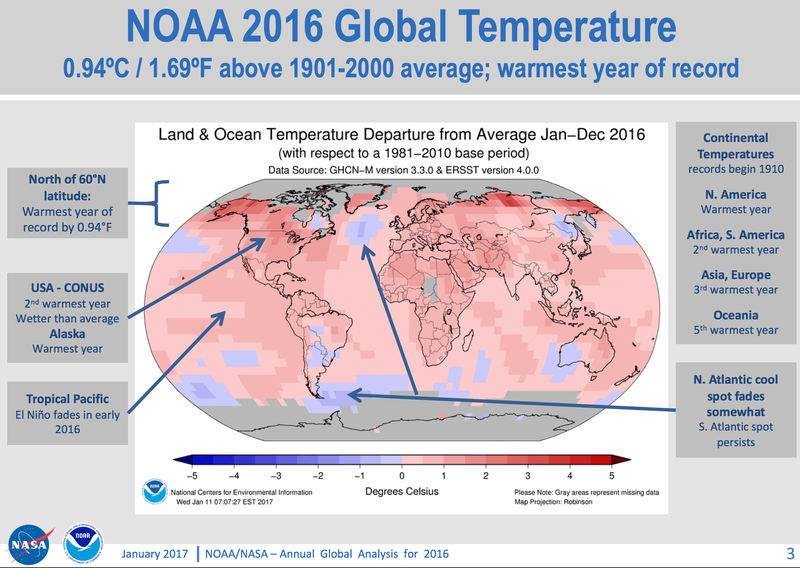 NOAA scientists concur with the finding that 2016 was the warmest year on record based on separate, independent analyses of the data. Because weather station locations and measurement practices change over time, there are uncertainties in the interpretation of specific year-to-year global mean temperature differences. However, even taking this into account, NASA estimates 2016 was the warmest year with greater than 95 percent certainty. 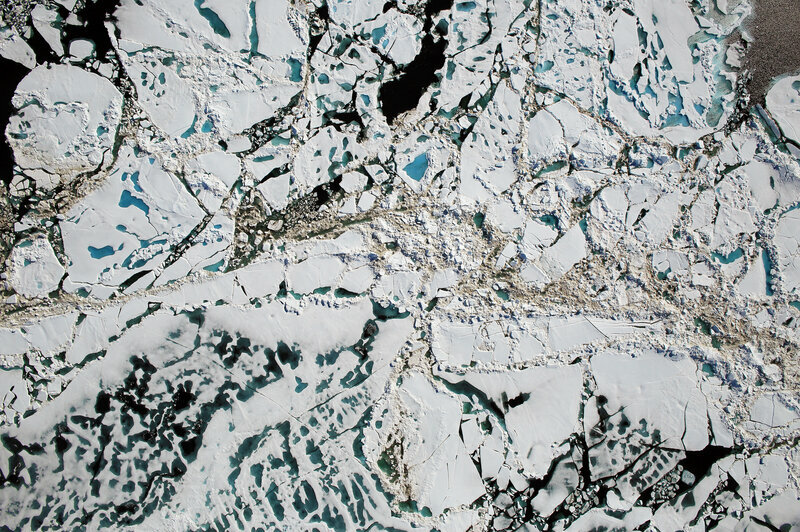 Chunks of Arctic sea ice, melt ponds and open water are all seen in this image captured by NASA's Digital Mapping System instrument during an Operation IceBridge flight over the Chukchi Sea in July 2016. Last year was particularly bad for Arctic sea ice. Most of the warming occurred in the past 35 years, with 16 of the 17 warmest years on record occurring since 2001. Not only was 2016 the warmest year on record, but eight of the 12 months that make up the year – from January through September, with the exception of June – were the warmest on record for those respective months. October, November, and December of 2016 were the second warmest of those months on record – in all three cases, behind records set in 2015. Phenomena such as El Niño or La Niña, which warm or cool the upper tropical Pacific Ocean and cause corresponding variations in global wind and weather patterns, contribute to short-term variations in global average temperature. 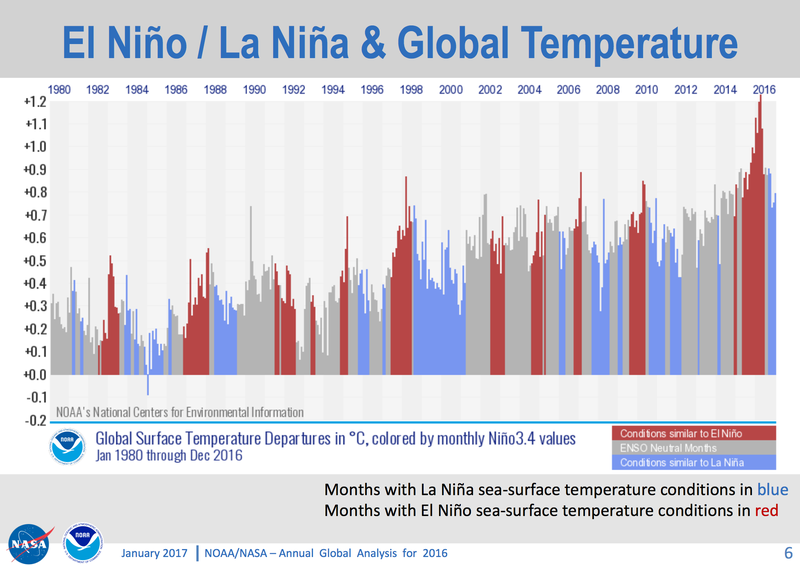 A warming El Niño event was in effect for most of 2015 and the first third of 2016. Researchers estimate the direct impact of the natural El Niño warming in the tropical Pacific increased the annual global temperature anomaly for 2016 by 0.2 degrees Fahrenheit (0.12 degrees Celsius). The Conversation : How can we predict the hottest year on record when weather forecasts are so uncertain? The fallout from climate change is often framed as a terrestrial problem, yet global warming is having profound effects on marine life. Scottish fishermen have uncovered an intriguing way to supplement their income: they have added squid to the menu of marine creatures they regularly pull from the sea. A species normally associated with the warmth of the Mediterranean, rather than the freezing north, may seem an odd addition to their usual catches of cod and haddock. Nevertheless, squid has become a nice little earner for fishing boats from Aberdeen and the Moray Firth in recent years. Thirty years ago, squid was a rarity in the North Sea. Today, boats bring back thousands of tonnes a year – though cod and haddock still dominate catches. Nor is this warm-water addition to northern fish menus a unique feature. Red mullet, sardines and sea bass have also appeared with increasing frequency in North Sea fishermen’s nets in recent years. All of them are associated with warmer waters and their appearance is seen by many scientists as a sign that climate change is beginning to have a serious impact on our planet’s oceans. For Scottish lovers of fresh squid, this is good news. However, in many other parts of the world, rising sea temperatures – triggered by climate change – are providing fishing industries and governments with major headaches. Fish are moving hundreds of miles from their old grounds, sometimes out of zones that had been set up to protect them. In other cases, fish are simply disappearing from nets. Part of the problem has its roots in past overfishing. But now climate change is exacerbating the issue. Last week, scientists revealed that a vast chunk of ice was set to break away from the Antarctic Larsen C ice shelf, while Arctic sea ice extent is now at its lowest level for this time of year since records began. And if sea temperatures continue to rise, even greater disruption will be caused to fishing stocks. Fishermen will lose their livelihoods and communities will be deprived of their only source of food. “There is an unambiguous trend,” said marine biologist Andrew Bakun of Miami University. Seafood is the critical source of protein for more than 2.5 billion people today. However, over-exploitation in the past has resulted in a crash in fish stocks, with the result that the world’s annual catch is now decreasing by more than 1 million tonnes every year – despite the availability of the latest fishing technology: nets big enough to engulf cathedrals, echo locators, satellite navigation, and powerful engines to drive boats. Now climate change is making the management of this threatened supply even more difficult. 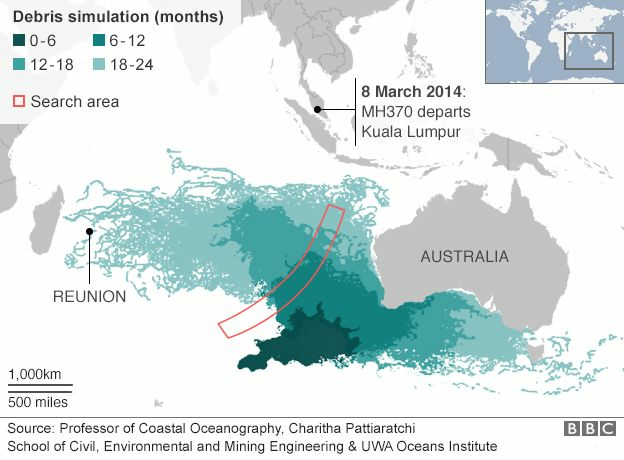 “All the world’s oceans are facing intense problems but the problem is going to be particularly serious for tropical countries, which are often underdeveloped and are far less able to maintain sustainable management regimes for their fisheries,” said marine biologist Callum Roberts, of York University. An example is provided by Bangladesh. Fish gives the nation 60% of its animal protein and is vital to the 16 million Bangladeshis living near the coast, a number that has doubled since the 1980s. However, a study – led by Jose Fernandes, of the Plymouth Marine Laboratory – of two key fish species, Hilsa shad (Tenualosa ilisha) and Bombay duck (Harpadon nehereus), showed that stocks of both could be devastated by climate change that would affect nutrient flows in coastal waters, ocean temperatures and sea levels. The introduction of sustainable management measures would offset some of these impacts but stocks still face being cut significantly, the group added. “Both the sea and land environment are changing,” said Fernandes. Think of the problem as a double whammy, said marine ecologist Malin Pinsky, of Rutgers University, New Jersey. Pinsky points to the example of the Atlantic cod in the Gulf of Maine. “It has been badly hit by intense overfishing. Now it appears that warmer waters have been reducing survival even further. Global warming is profoundly changing the seas and oceans that surrounds us. Fishermen in Milazo (South Italy) catch fish they never used to catch before. 90% of the alien fish species in Milazo have a tropical or a subtropical origin. Managing fish stocks in a warming world is proving to be a particularly thorny problem, he added. As waters warm, fish seek cooler waters and head to higher latitudes, a problem that has also been highlighted in the North Sea. There, closure areas have been set up to protect spawning and nursery grounds of plaice, herring and sandeel from intense fishing. “But if species shift their distribution in response to climate change it is possible such measures will become less effective in the future,” says a study by a group of scientists led by John Pinnegar, of the government-funded Centre for Environment, Fisheries and Aquaculture Science (Cefas). Another example of the problem was highlighted last week by the New York Times, which noted that the centre of the US black sea bass population is now found in waters off New Jersey. In the 1990s, it was hundreds of miles further south. Under fishing rules that were laid down then, North Carolina fishermen are still entitled to the largest share of black sea bass catches – which requires them to steam north for 10 hours to reach the black sea bass’s current fishing grounds. By contrast, local New England fishermen are allowed to catch a small fraction of the black sea bass now found in their own neighbourhood and must throw all excess overboard. The issue has already reached the status of causing international discord, as is revealed through the example of the humble mackerel. “Until recently, mackerel in the Atlantic were fished mainly by Britain, Ireland and Norway and stocks were protected by an EU quota system,” said Roberts. “Then stocks began to head north, most probably because sea temperatures were rising. Eventually, mackerel reached Iceland – at which point Iceland asked to be included in fishing quotas. The result was a drop in mackerel stocks and an international dispute that lasted several years and which has only recently been resolved – though this respite may only be temporary. “Unless we find ways to adapt quota agreements speedily and efficiently, we are going to see a lot more disputes like this one in future,” Roberts said. 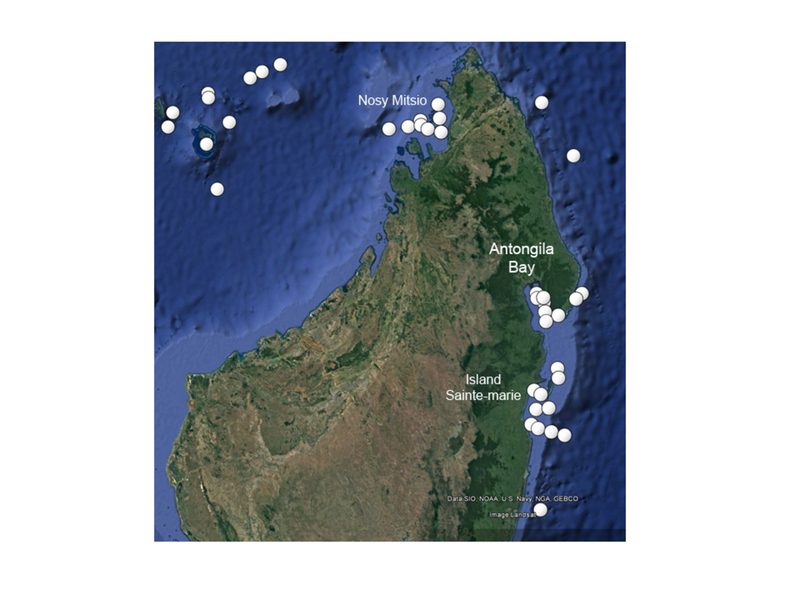 This point is highlighted in the study led by Pinnegar, which revealed that anchovy stocks are now spreading along the south coast of England. Talks are taking place to determine whether French or Spanish boats can fish for these – on the grounds that these stocks are extensions of existing populations from the south. Others argue that the new anchovy stocks are a separate population that is only now rebounding in numbers thanks to greatly improved climatic conditions, and that French and Spanish boats should be allowed only restricted access to them. The “anchovy wars” are looming, it would seem. In addition to overfishing and warming sea temperatures, marine creatures face a further danger: ocean acidification. Increased amounts of carbon dioxide, pumped into the atmosphere from cars and factories, are being absorbed by the oceans, making their waters more acidic. The impact on coral reefs, which provide homes to thousands of different species of fish, is already being felt. Last year, it was reported that a rare underwater heatwave, combined with an increase in ocean acidity, had destroyed swaths of Australia’s Great Barrier Reef. This has led marine biologists to warn that all coral reefs risk being destroyed by the end of the century even if carbon dioxide emissions are kept to relatively low levels in future decades. Apart from the impact on one of the world’s greatest natural wonders, the effect on fish stocks, and in particular shellfish, could be grim. Shells of marine creatures are made from calcium carbonate and their formation is disrupted by acidic water. This video shows how climate change is causing waterways to warm, eroding fish populations from the Pacific Northwest to the Midwest and Maine. A warming world means warmer waters, threatening the livelihood of our fishermen, our traditions, and what we can serve on our dinner tables. An example is provided by oyster farms on the Oregon coast. These farms regularly suffer from upwellings of acidic water from deep regions of the Pacific. When this happens, larval oysters die at the point when they have to form their first shells. “From the time eggs are fertilised, Pacific oyster larvae precipitate roughly 90% of their bodyweight as calcium carbonate shell within 48 hours,” George Waldbusser at Oregon State University told the Climate News Network. “They must build their first shell quickly on a limited amount of energy – and, along with the shell, comes the organ to capture external food. It becomes a death race of sorts. Increasingly, the answer to this question appears to be no. This point is summed up by Roberts. “Prawns, lobsters, clams and scallops – which now dominate our intensively fished seas – all lay down carbonate shells. The fishing industry is therefore badly exposed to risk from more acidic seas. Not only that, acidification threatens the important role that filter-feeding shellfish play in cleansing ocean water. And then there is question of just how much seafood is actually eaten today. This turns out to be an issue of considerable controversy, one that was stoked last year in a study – by Daniel Pauly and Dirk Zeller of the University of British Columbia – that was published in the Nature Communications online journal. It indicates that the UN’s Food and Agriculture Organisation (FAO) has seriously underestimated the world’s appetite for fish and miscalculated global annual catches. The FAO – using figures provided by individual governments – had suggested that annual catches began rising significantly over the 20th century, peaked at 96m tonnes in 1996 and have been declining slowly since then – largely due to the fact that fish stocks had been so seriously overfished. Pauly and Zeller put the annual “peak fish” figure for 1996 at 130m tonnes while adding that levels have fallen off far more dramatically and worryingly as stocks have become depleted at a rate that is far sharper than realised previously. In other words, far more fish – millions of tonnes – is being taken from the seas than has been recorded by official statistics. This extra annual catch is made up by small-scale and subsistence fisheries and fish thrown back in the sea as discards, according to Pauly and Zeller. What is particularly worrying about this discovery is the sharp rate of decline of fish catches in recent years. Despite sending out more boats, fitted with advanced fish detection technologies, fishermen are unable to catch as much as they used to. Nor do Pauly and Ziller anticipate that it will stop. “I expect a continued decline because I don’t expect countries to realise the need to rebuild stocks,” Pauly told the Guardian. “I don’t see African countries, for example, rebuilding their stocks, or being allowed to by the foreign fleets that are working there, because the pressure to continue to fish is very strong. It is against this grim background that the world’s oceans are warming significantly, with temperature rises of several degrees being forecast by the end of the century. Inexorably, fish stocks will be pushed further towards high latitudes, confusing attempts to manage and to protect them, while the make-up of local fisheries will undergo drastic changes. The stress on one of the world’s most important resources is going to be intense. The great fish migration has begun. Climate change research relies on models to better understand and predict the complex, interdependent processes that affect the atmosphere, ocean, and land. These models are computationally intensive and produce terabytes to petabytes of data. Visualization and analysis is increasingly difficult, yet is critical to gain scientific insights from large simulations. The recently-developed Model for Prediction Across Scales-Ocean (MPAS-Ocean) is designed to investigate climate change at global high-resolution (5 to 10 km grid-cells) on high performance computing platforms. In the accompanying video, we use state-of-the-art visualization techniques to explore the physical processes in the ocean relevant to climate change. This project exemplifies the benefits of tight collaboration among scientists, artists, computer scientists, and visualization specialists. The global ocean is the Earth's heating and cooling system, pushing balmy tropical waters toward the poles and bringing back colder, nutrient-rich waters. 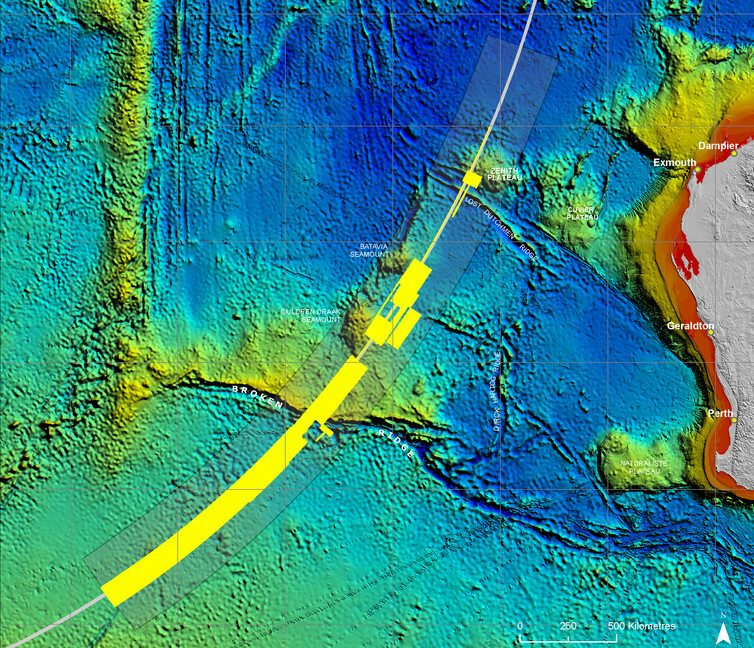 But modeling this system is extremely complex, resulting in billions of data points. To tackle the complexity, researchers at three Princeton-area institutions have transformed complex modeling data into an easily understandable animated movie showing how ocean temperatures and saltiness change over time. The animation could help climate researchers explore how factors such as rising carbon dioxide levels alter the ocean's ability to transport heat. The animation illustrates the power of visualization techniques for presenting complex data in ways that are readily understandable, said Eliot Feibush, leader of the Princeton Visualization Consortium, which brings together researchers from the University's Princeton Institute for Computational Science and Engineering (PICSciE), the U.S. Department of Energy's Princeton Plasma Physics Laboratory (PPPL), and the U.S. Department of Commerce's National Oceanic and Atmospheric Administration's Geophysical Fluid Dynamics Laboratory (GFDL). A new video animation demonstrates the power of data visualization techniques to make sense of vast amounts of information. The animation, which reveals how ocean temperatures and salinity change over the course of a year, is based on data from global climate models. These models aid our understanding of the physical processes that create the Earth's climate, and inform predictions about future changes in climate. "People are working with increasing amounts of data in all areas of science, and they need better ways to evaluate their results," said Feibush, who divides his time between PPPL and PICSciE. "The techniques we developed are being applied to climate modeling but the methods can be used for other complex data sets that change over time," he said. Data visualization techniques make it easier to comprehend information, spot trends and even identify mistakes, Feibush said. "Visualization helps us to understand complexity — it is more than just a pretty picture." Hindcast of the peak of the 2008 hurricane season, one of the most active on records, simulated by an FV3-powered GFDL model at 13-km resolution. FV3 improves representation of small-scale weather features such as hurricanes while maintaining the quality of large-scale global circulation. Matthew Harrison, a climate scientist at GFDL, worked with Feibush to adapt results of climate models into formats that could be used to generate the animation. Climate models are computer programs that combine real-world observations of temperature, salinity, rainfall amounts and other factors with physical laws. The models can help researchers better predict long-term climate changes and short-term weather forecasts. "Understanding how heat moves through the ocean is essential for predicting the behavior of the climate we experience on land," Harrison said. The process starts when tropical waters soak up the sun's heat. Ocean currents push heated water toward the poles, warming not only the northern and southern oceans but also the air and land. This "ocean heat engine" makes northern Europe considerably more habitable than it otherwise would be. In the North Atlantic, warm water from the tropics rides the Gulfstream extension northward toward the Norwegian Sea and mixes with cold water from the Arctic. Cold water is denser than warm water, so the mixed water sinks and makes its way eventually southward, bringing nutrients to fisheries off the coast of North America. The water's saltiness, or salinity, plays a significant role in this ocean heat engine, Harrison said. Salt makes the water denser, helping it to sink. As the atmosphere warms due to global climate change, melting ice sheets have the potential to release tremendous amounts of fresh water into the oceans. Climate visualizations can help researchers see how the influx of fresh water affects global ocean circulation over time. The animation reveals how factors like evaporation, rainfall and river runoff affect salinity. For example, the Mediterranean Sea, which lies in an arid region and has only a narrow outlet, is much saltier than the nearby Atlantic Ocean. In contrast, over 250 rivers flow into the Baltic Sea between mainland Europe and Scandinavia, so the sea is about seven-times less salty than the Atlantic Ocean. One of the special aspects of this video animation is its high resolution, Harrison said. The simulation's resolution is six million pixels, which is like dividing up the world's ocean surface into a grid consisting of six million sectors. 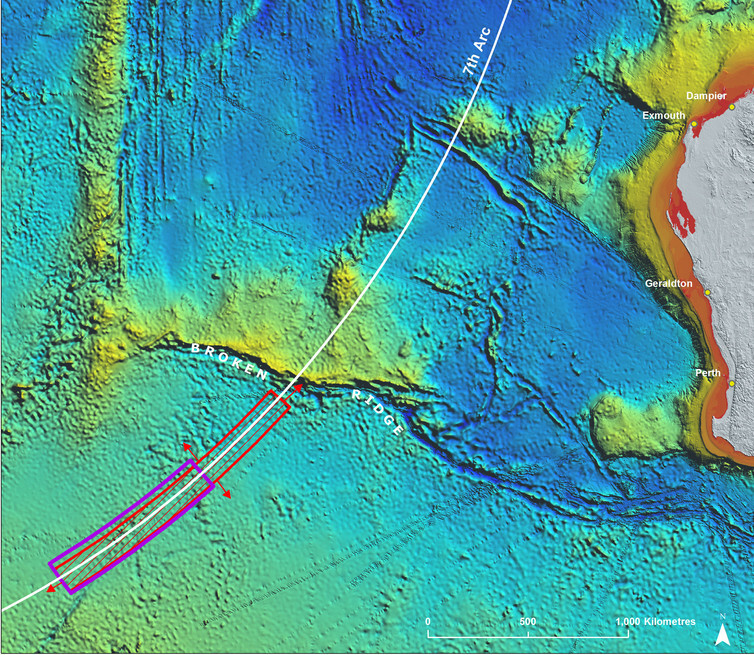 Each sector corresponds to an ocean area of about 10 kilometers on each side. The model calculates the temperature and salinity for each sector, which becomes a pixel, or a colored spot on the screen. In the real world, weather conditions change from moment to moment. To capture this variability, GFDL's climate models incorporate weather conditions collected from ground stations and satellites to update the model hourly with near-surface wind speeds, temperature, rainfall and solar radiation. The calculations run on supercomputers at Oak Ridge National Laboratory in Tennessee. "There is an art to handling large amounts of data," said Whit Anderson, deputy director of GFDL and himself an oceanographer. "You cannot just brute-force the large and complex data produced at facilities like GFDL and PPPL through a commercial product. "The increase in the amount of data is due to our better understanding of climate and weather," Anderson continued. "These large amounts of data in turn are giving us improved skill in predicting future climate and weather." The video animation could help climate researchers explore how factors such as rising carbon dioxide levels alter the ocean's ability to transport heat. Feibush credits the project's success to his student interns, some who started on the visualization project at PPPL while in high school. "Without the students, this wouldn't have happened," Feibush said. One of these students, Matthew Lotocki, started working with Feibush while a senior at the Bergen County Academy for Technology and Computer Science, a public magnet high school in New Jersey. "It was an amazing opportunity," said Lotocki, a member of Princeton's Class of 2017. "You get to work with cutting-edge computer clusters and systems, really interesting projects, and with a mentor who teaches you how to make the tools to create really cool visualizations." One of the challenges was figuring out how to combine different types of computer processors to work on the task. Today's scientists often take advantage of the power of video-game graphics processing units (GPUs) to do their computations. Lotocki had to get the GPU to do the calculations and generate the graphics on the screen. Another student intern, Michael Knyszek, who attends the University of California-Berkeley and who had an internship with Feibush as part of the Department of Energy Science Undergraduate Laboratory Internship program, programmed the GPU to combine layers of data. The developers made the video animation look more realistic by incorporating NASA satellite data of the changing colors of the terrain to show typical seasonal changes. Zachary Stier, Princeton Class of 2020, also worked on the project as a student at the Bergen Academies. "A lot of the challenge was figuring out the right tools to address the questions we had at hand," Stier said. "There were some tasks for which there was no documentation for what we wanted to do." The experience working at PPPL was one of the factors that influenced Stier's decision to come to Princeton. "I am much more able to look at a problem and do the research into what tools are available to attack the problem," he said. The consortium combines three institutions, each with a different research focus. Princeton University is home to expert scientists in a wide range of disciplines. Scientists at PPPL, which is managed by Princeton University, are developing fusion energy, which involves creating charged gases known as plasmas in a confined reactor for safe and abundant sources of electricity. GFDL's expertise is climate modeling. "Our organizations all work on very different things but one thing that we all have in common is the need to visualize large and complex data," Anderson said. Funding was supplied by the U.S. Department of Energy and the National Science Foundation.